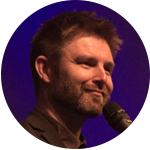 Richard is the Lead Pastor of Hillsong Church Amsterdam. Richard is a Aussie by birth, a Dutchie by blood and lived in London where he met the gorgeous American Debbie. A perfect mix that fits ‘just right’ here in Amsterdam. Richard is passionate about God and people and seeing the church be all that she can be. He is a gifted teacher, loves helping people get their own revelation of the message of Jesus and empowers them to impact their day-to-day life. One of their favourite things to do in their spare time is be on a boat on the canals, what better place is there too show off and enjoy this beautiful city. They’re passionate about seeing the city of Amsterdam come to know Jesus Christ and the nation to receive the Good News of what He has done.